I work in a large public high school. Most of my colleagues are not special educators. They teach algebra, or English, or a slew of other classes to which students trudge on a daily basis. During our August teacher work days, they labor over finishing syllabi and setting up their Canvas calendars. 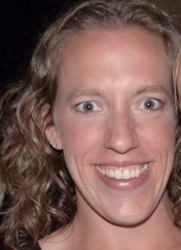 Remarkably, none of these teachers take their ID photos sparkling with a sheen of sweat on their foreheads after a long morning of lugging around desks. Every year, I’m the sweaty one. 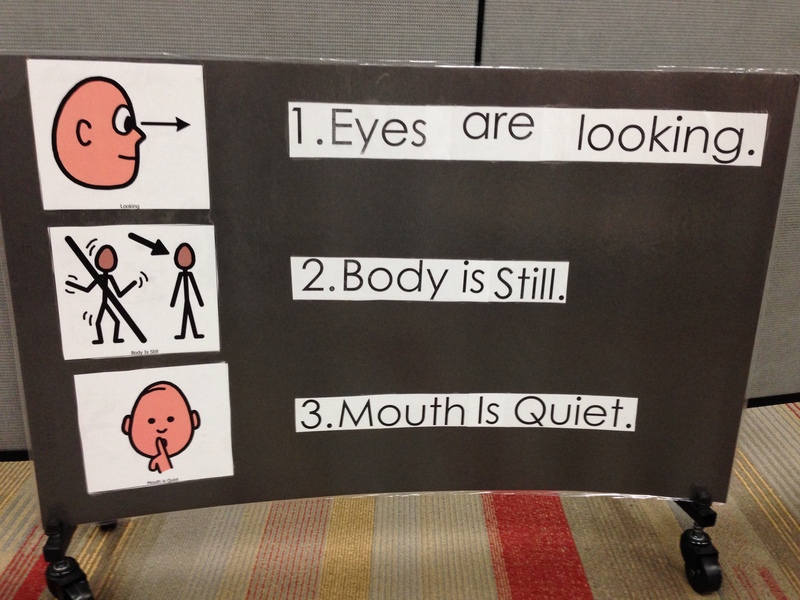 Classroom environment is extremely important for students with significant disabilities, particularly for students with autism and sensory needs. 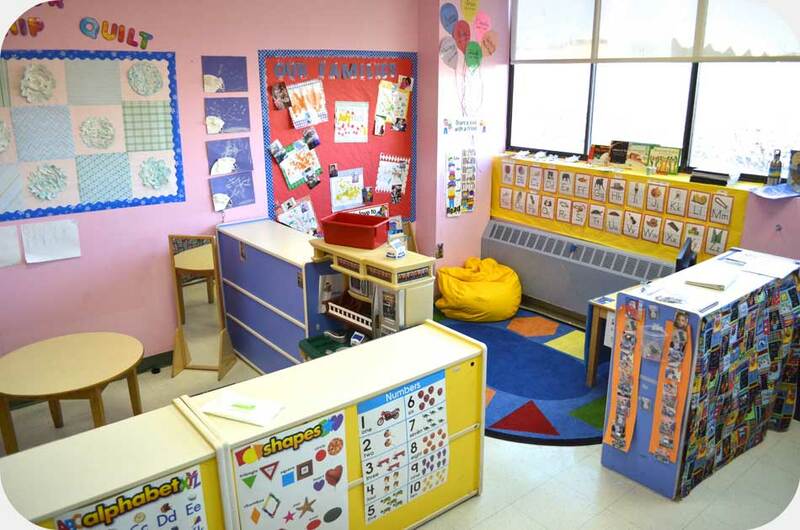 The physical structure and lay-out of a classroom needs to be thoughtfully and intentionally designed in order to maximize physical space while meeting the needs of all learners. Most students with classic autism/developmental disabilities will be most ready to learn when spaces are visually defined. The environment needs to give students a clue about what he/she will be doing and what the expectations are while the student is in the area. I find that most of the examples online regarding physical classroom structure for students with autism target elementary school kids. This is great—the high school structure truly is just an extrapolation of this example—but there are important differences for the high school kids. The first difference is that high school students are bigger. Much bigger. They need bigger tables, bigger chairs, and more space to move from one space to another. They are taller so they can see over tiny shelves. 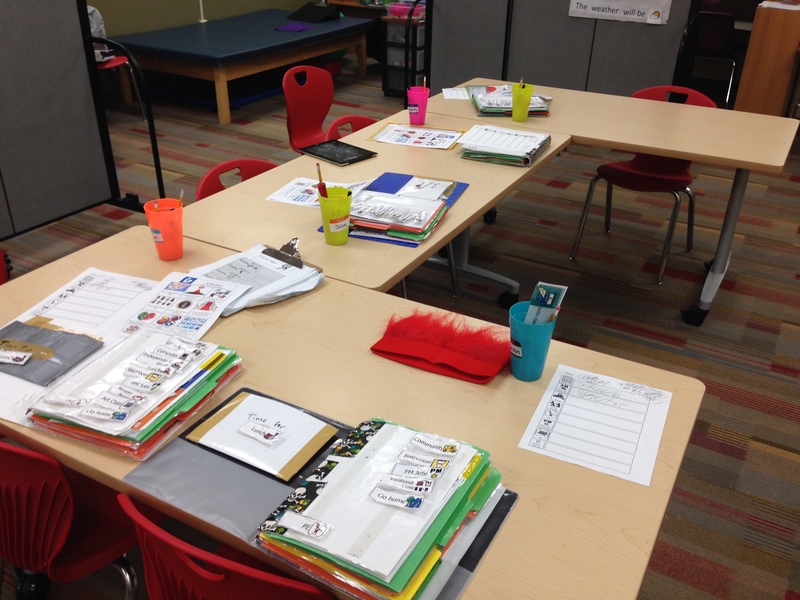 Here is an example of an elementary school structured classroom. The spaces are quite clearly defined and I’m sure it works well for pint-sized learners—but look how small the furniture is! And how short the room dividers are! Additionally, the classroom décor (including the open windows) would make for too ‘busy’ an environment for some of my students with autism. It would also not be age appropriate for high school students. This simply will not do for a high school classroom for structured learners. I hope to write about my physical classroom structure along with examples with what students complete in these spaces. I find it difficult to separate the explanation of the physical design from the activity since they are so closely entwined. When students arrive at school, they first visit their lockers to drop off their coats, boots, lunches, etc. 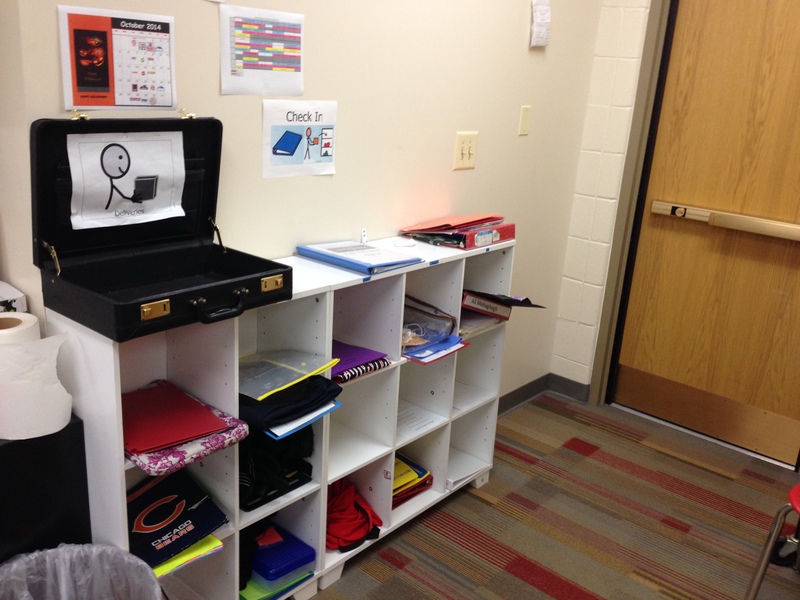 Students walk past their cubbies as they enter the classroom. 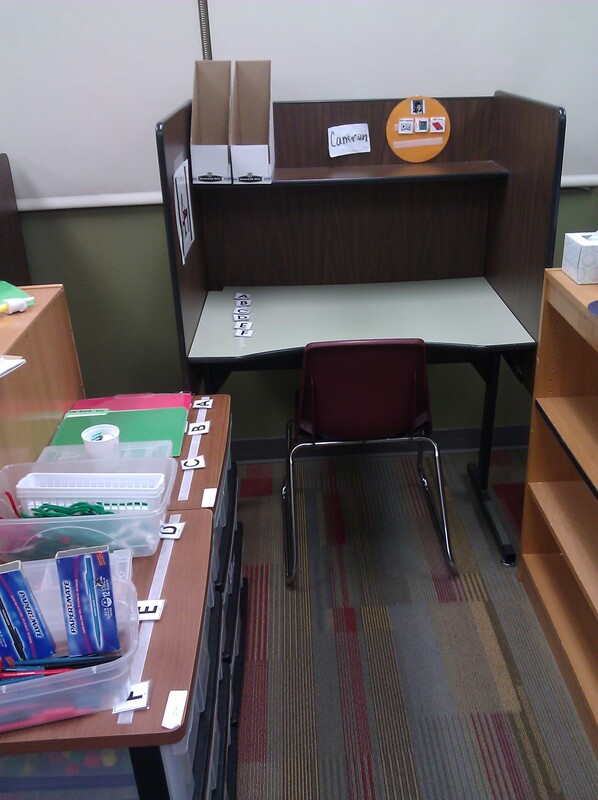 Each student’s cubby is labeled with his/her name. He stores his take-home folder and other accessories in the cubby, removes his schedule binder, and heads to his classroom seat. You can see that there is a visual cue above cubby (Check In, with a picture of a schedule binder and someone putting things away). There is also a suitcase labeled ‘deliveries’ where I toss things during the day that need to be delivered elsewhere in the building. A student will make these deliveries every afternoon as part of a classroom job. Above the suitcase is our community calendar for the month of October as well as a job schedule. The job schedule is more for the benefit of staff… Student jobs will be included on each student’s daily schedule. After students move their schedule binders to their seats, they are able to choose a leisure activity to engage in until 8:00. Choices are arranged on a large circular choice board. 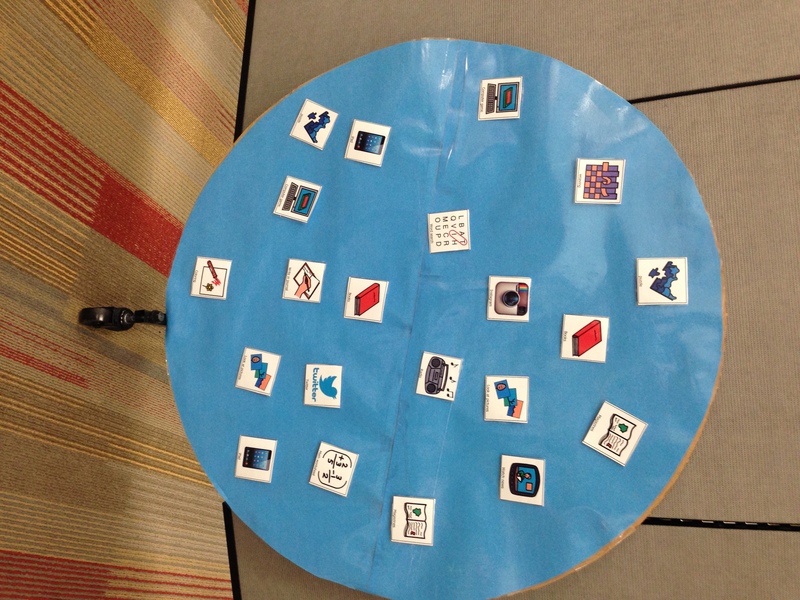 I use circles when students are provided a choice to signal that they can choose any icon on the board. When symbols are arranged vertically or horizontally, students have been taught that they should move either left to right or top to bottom in order, like a schedule or a task list. I use two types of homeroom schedule. 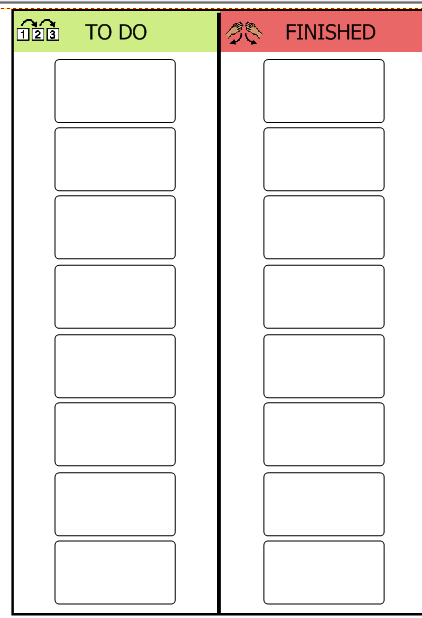 One is a Boardmaker template with ‘to-do’ and ‘finished’ columns. The other is a more sophisticated, checklist-style schedule. It is a little more specific and has worked well with students who are more prompt dependent. Students follow their schedule from top to bottom, left to right. The morning activities are on the left and the afternoon activities are on the right. When the timer goes off to signal the end of homeroom, students record one thing they did during homeroom on their student feedback form and move on to the next item on their schedule, the first work station. The student feedback form goes home with each student daily. 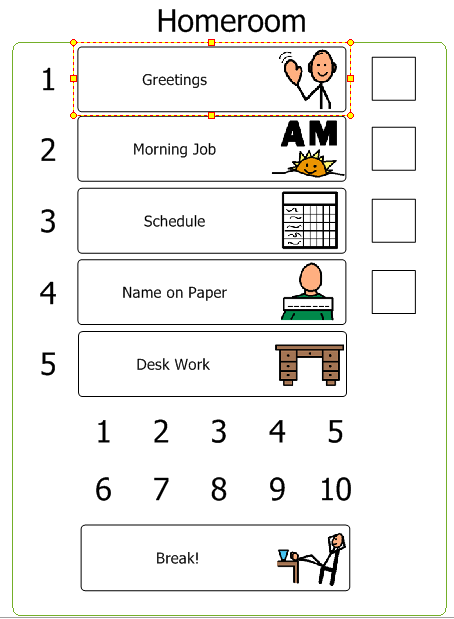 It is a great tool for parents to use to see what their child does each day and to have a conversation with them about their school day. Students will continue to fill in what they do during each session throughout the day. Students each have four work stations in the morning. Each work station is approximately 25 minutes. One work station is independent work. 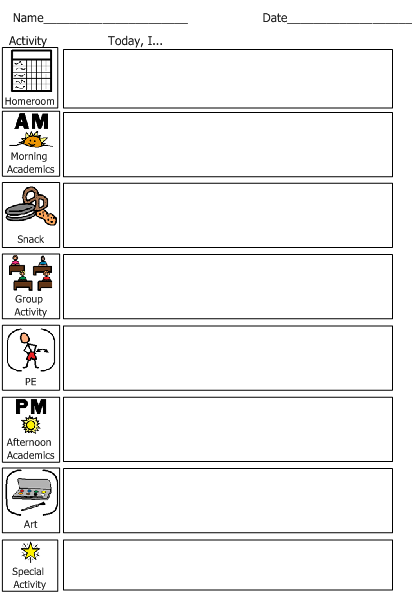 Students choose a reinforcer/preferred leisure task, and follow a task list to complete mastered work independently. Generally, no prompts are given at the independent work stations. 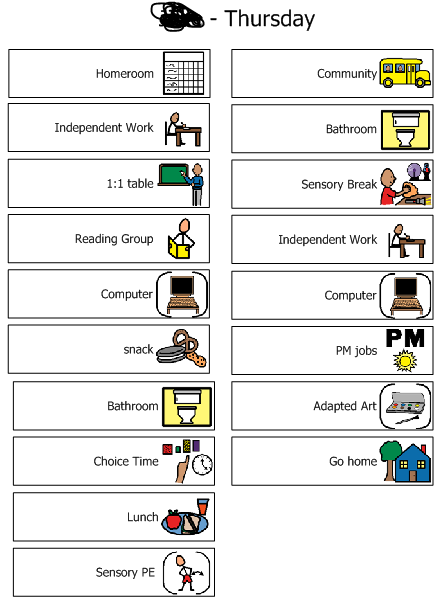 Work tasks include sorting, academic work, pre-vocational work, and other tasks that promote independence. At times, the goal is to increase stamina working independently. At other times, it is to have the student continue to practice goals that they have mastered. 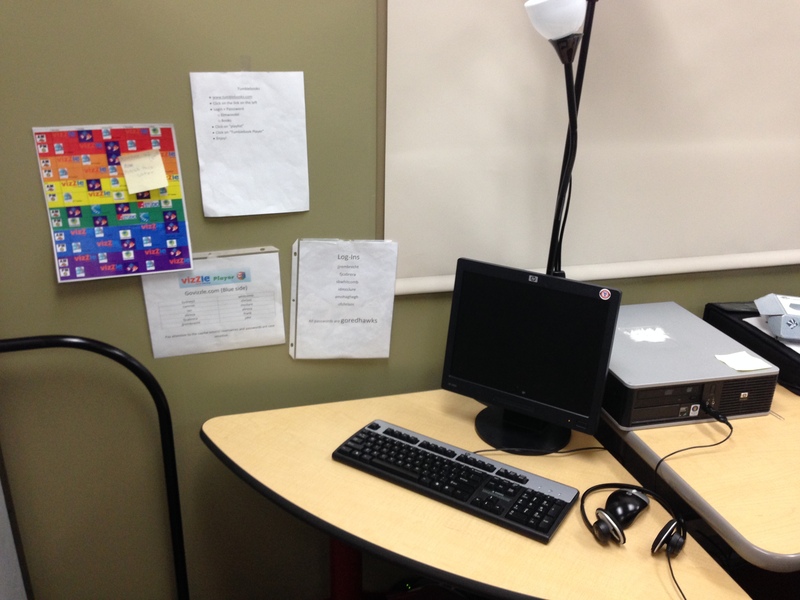 You can see in this picture that the student has a list of activities on the left side of his desk. He matches each number to the corresponding number on the left and grabs the appropriate task. When he completes it, he moves the task to the right, puts it on the shelf, grabs the next number, and continues down the line. When he finishes, he gets to engage in the activity he selected for the remaining amount of time in the rotation. The paraprofessionals in my classroom are wonderful—they know who has mastered which tasks (this is usually noted on the task somewhere) and they rotate the tasks through the students’ bins. Paraprofessionals collect data on tasks complete, elapsed time, prompts needed, etc. Another work station is reading group. My school has purchased the Unique Learning System (ULS). The ULS comes with different books with corresponding reading comprehension questions. A paraprofessional mans this station and works on the ULS, News2You, or another reading activity with a pair of students. In the picture, you can see a bottle of hand sanitizer—another reading group staple, especially during cold season! A third work station is computers. Students access a variety of programs independently. Necessary cues are hung on the wall, including passwords, log-in information, and a schedule of which program students should work on at different times. A fourth work station is working 1:1 with me. We work on a wide variety of things at the 1:1 table, but we focus on working on skills that will help the student become independent and then generalizing them to the rest of the classroom, school, and community. I generally sit next to the student when we are working on new academic skills, and face the student when we are explicitly working on conversational exchanges. A fifth work station is domestics. We are lucky enough to have a domestic center with a mock apartment, including a bedroom, kitchen, and living room. 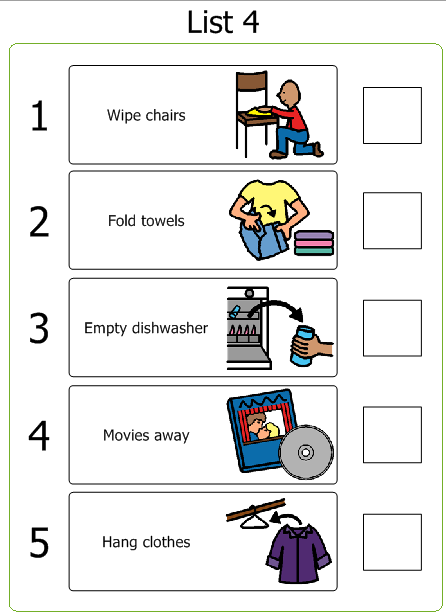 During domestics, students follow a checklist to complete a variety of domestic skills. Typically they work 1:1 with a paraprofessional or typical peer in the domestic center. 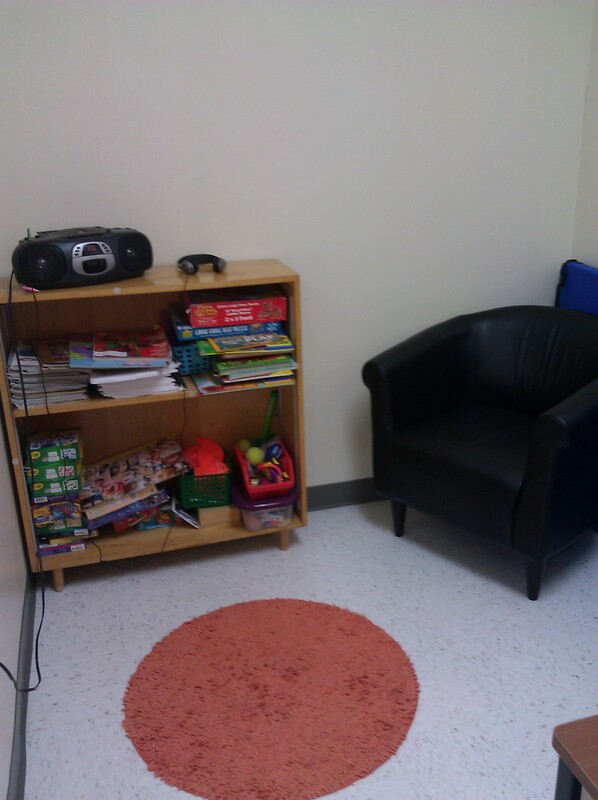 After four work stations, we typically have bathroom, and then a sensory break. Students are able to take sensory breaks throughout the morning on request, but sensory breaks are built in to schedules in the morning and afternoon. The time I have with students in the morning goes from 7:45-10:30. After that, students travel to lunch in the cafeteria, and then PE. They have PE with typical peers who had to go through an interview process to get their positions. The peers are phenomenal and allow our students to interact with typical peers in a way that might not be possible in other high schools. When students return to the classroom, we either go out for community instruction or we do a group activity. Group activities are done at a student’s ‘home base.’ We follow our group activity rules that have been explicitly taught. It is difficult to keep group instruction from turning into disjointed 1:1 instruction, moving from student to student. Joint attention is a major struggle. It is important to keep these short and well-planned, with multiple access points for each student! After group activity/community, students have two more work stations and then complete their PM jobs. Students check their jobs using the job chart and jobs rotate occasionally. Jobs include checking mailboxes, making deliveries, closing the blinds, cleaning work stations, etc. After PM jobs, students have another sensory break and then head to adapted art. This is another class in which students work with typical peers. Again, the peers are wonderful and it is fun to see my students forming relationships with teens their age! Students complete their going home routines and board the buses after art, around 3:10. At some point during the day, students complete a grooming routine. Students are staggered throughout the day to prevent a back-up in the bathroom. The lighting in the classroom is fluorescent. There are two switch settings and we typically have the lights on the ‘low’ setting. I also purchased floor lamps from Ikea and we occasionally forgo the fluorescent overhead lights in lieu of the floor lamps, a much ‘softer’ light. We do not have any windows. All light must be produced artificially. The room dividers are on wheels and can be folded to be shorter. The base is fairly wide so it can be difficult for students with gross motor difficulties or students in wheelchairs to navigate the classroom. They are wonderful because they muffle some sounds and are tall enough that students can’t see over them. Extra bonus: You can staple or push-pin in to them in order to hang things up. We have two doors that exit directly to the hallway and one door that goes in to the domestic center. Escape artists must be carefully monitored. As you can see from the explanation and the photos, the students are extremely busy within the classroom and within the building from 7:45-3:10. 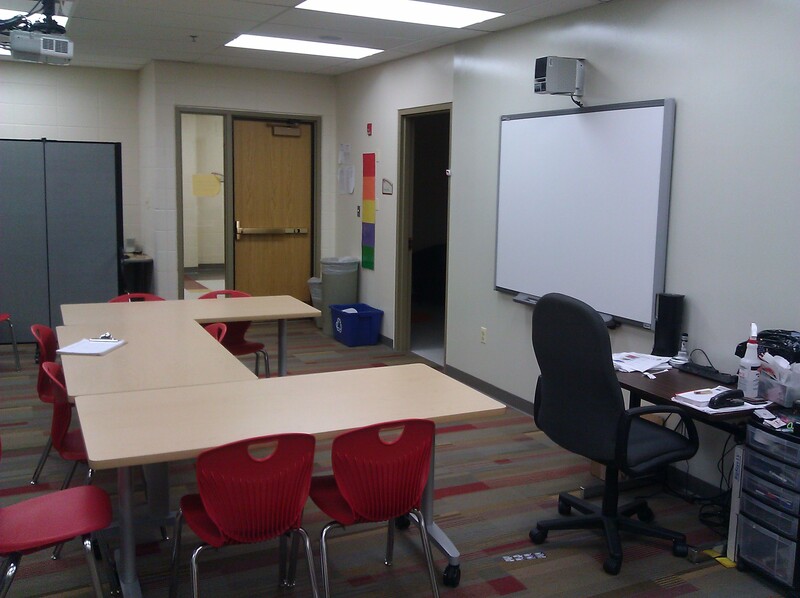 The structure provided by the physical lay-out of the room and the schedules is invaluable to all students and staff. Please feel free to share how you have structured your classroom. There are many ways to do this well! Want to see more? Check out Part Two here! I stumbled across your page and am so grateful! I teach in a private school and we just started this Special Education program that I feel like I’m in charge of and its HARD having no direction. 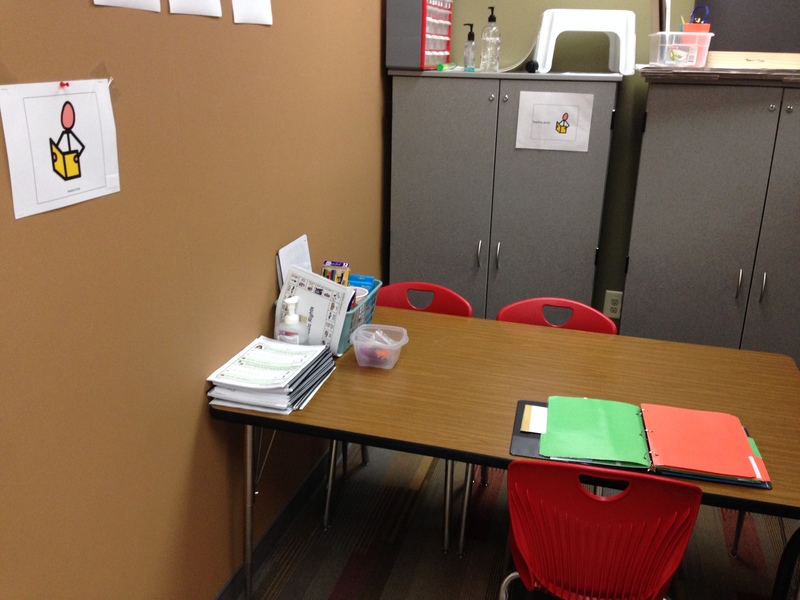 I love gleaning ideas from others and your classroom description and schedule are a great help to me. Thanks for sharing! Glad you find it helpful! Good luck–you are in a tough position but I’m sure your students will benefit from any changes you make for them! Thanks so much for sharing. This is really useful. Is there anywhere I can get the templates of the checklists you use to adapt them? Thanks. WOW! Am I grateful I stumbled upon this blog! I am a student going to school to become a K-12 Special Education teacher but I am really looking to do a Significant Support Needs classroom in the Secondary Level. I am about to start my student teaching and your ideas are really really awesome to see! Your classroom management seems very credible and it seems like that works in your favor! Thanks so much for this great page you have done wonders to my research.